Easter Island is probably the furthest populated place from anywhere on planet earth. 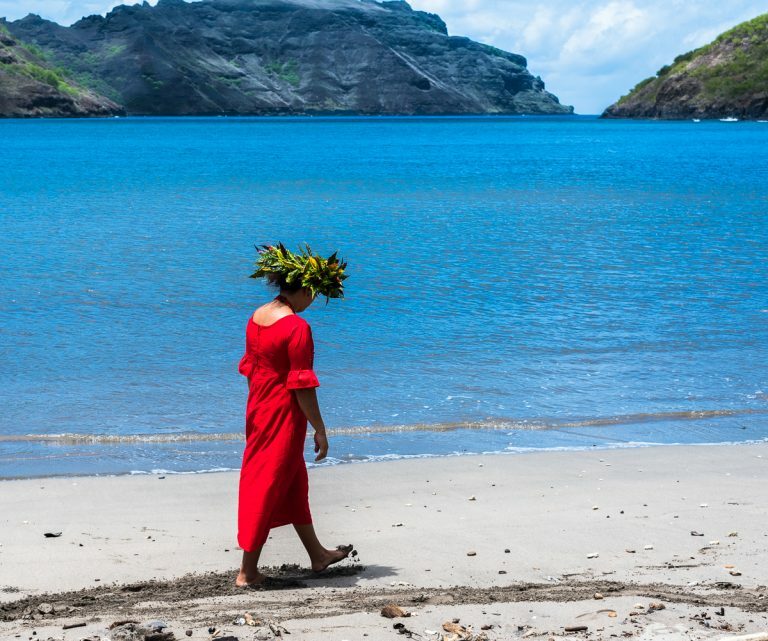 The nearest inhabited areas are Tahiti, which is 2,000 miles to the East, and Chile, which is 2,000 miles to the wet. 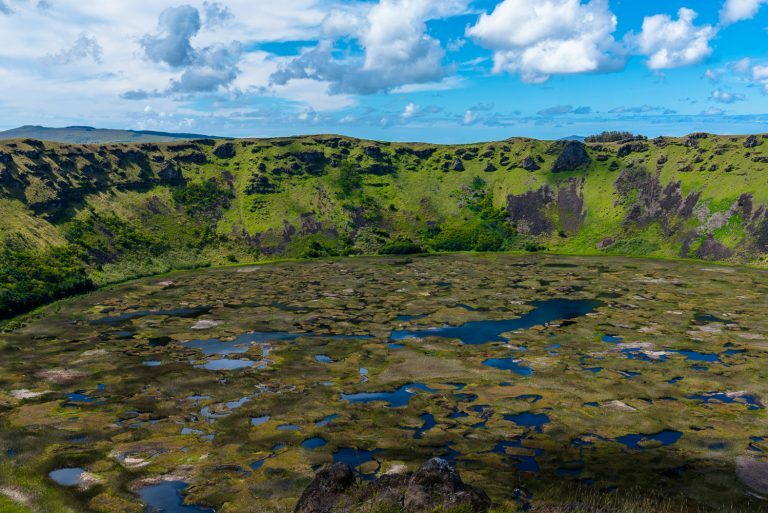 It is a triangular in shape, made from 3 (now extinct) volcanoes, and now has a permanent population of about 7,000 people. 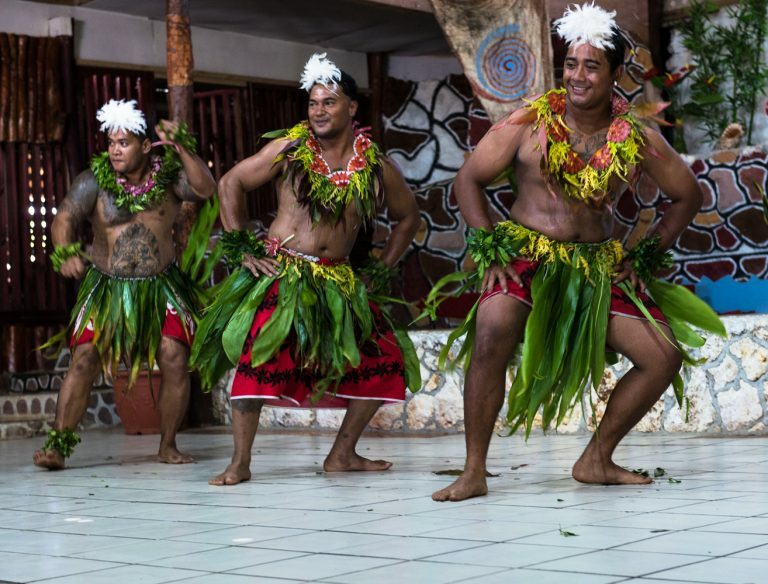 The island has been a source of fascination for decades, mostly because it houses something like 487 Moais—huge statues venerating tribal chiefs from a civilization that rapidly collapsed after reaching a peak population of about 10,000 – 15,000 around the year 1600. 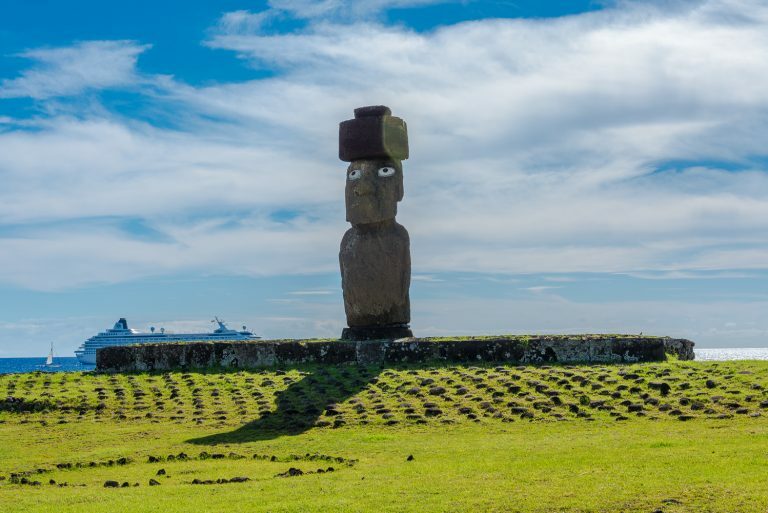 The reason for the collapse, combined with the existence of the huge Moai statues has tantalized academic researchers—as well as a fair number of cranks—for many years. 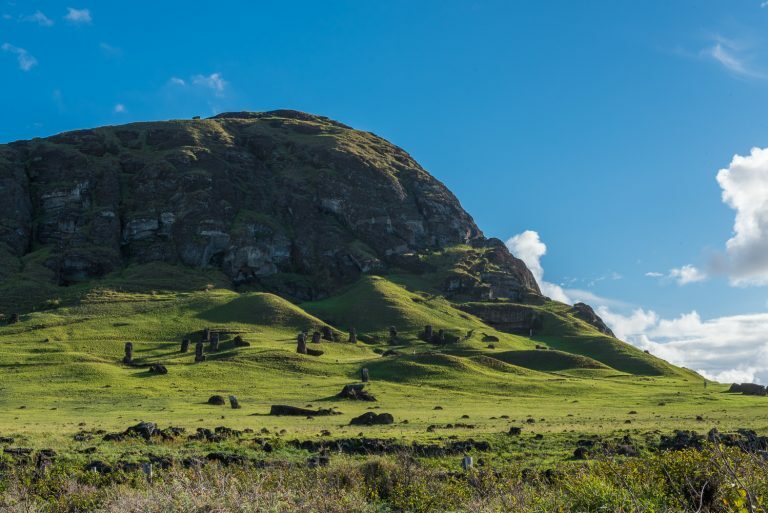 We were fortunate enough to be able to explore the island with a small group led by Professor Claudio Cristino, Easter Island’s resident archaeologist. (More on his work is available at this link to PBS: http://www.pbs.org/wgbh/nova/easter/move/team.html). 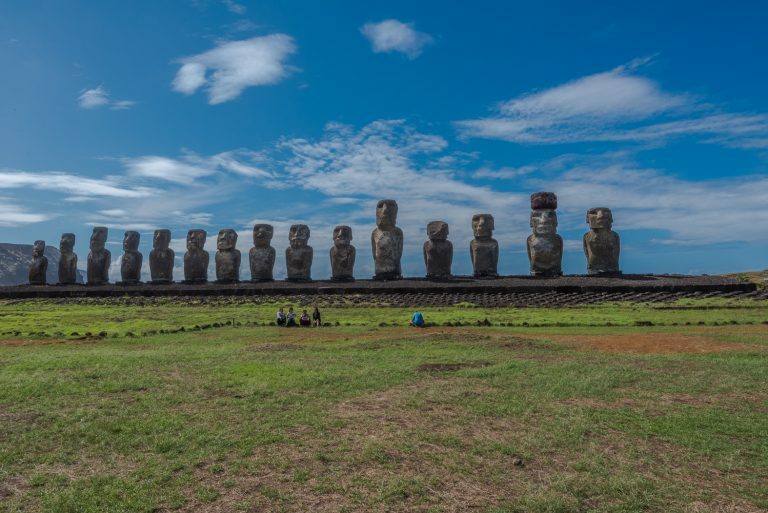 As it turns out the best explanation of the rapid collapse of the Rapa Nui civilization is resource depletion stemming from contests among the tribes to build the biggest Moai to the exclusion of all else. 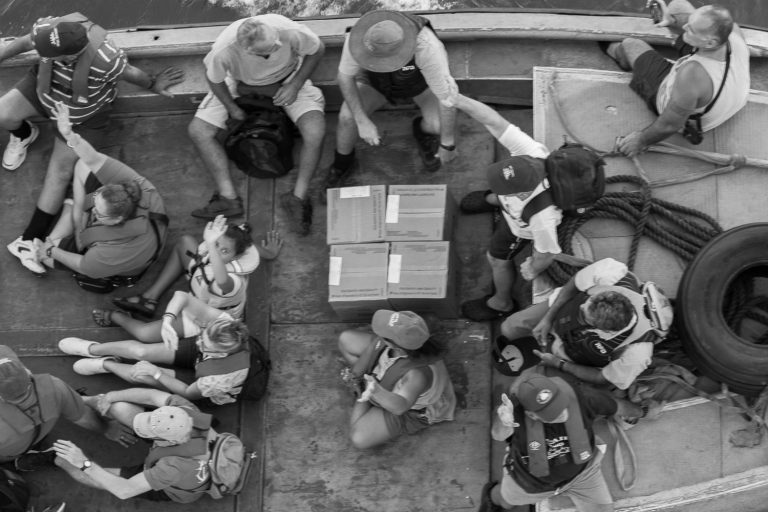 It is a fascinating story and an example of the tragedy of the commons in action. It has nothing to do with crackpot theories about outer space aliens coming to earth to direct earthlings to build huge statues. Over the two days of our touring, we got lots of shots of the Moai statues as well as extinct volcanoes. Please see below. Note size of Moais compared to people sitting up front. On April 28, 1789 Fletcher Christian led a mutiny against Captain William Bligh on the Royal Naval vessel, HMS Bounty. After the mutineers seized the ship they put Bligh and 18 loyalists on the ship’s launch and sent him on his way. Most of the mutineers went to Tahiti, the rest went to Pitcairn, led by Acting Lieutenant Fletcher Christianson. 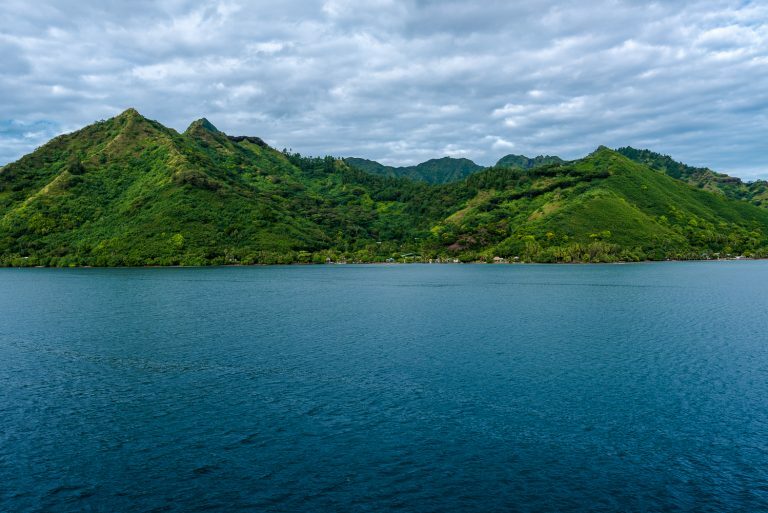 While the men who stayed in Tahiti were eventually captured by the Royal Navy, the men who went to Pitcairn were never found by their pursuers. 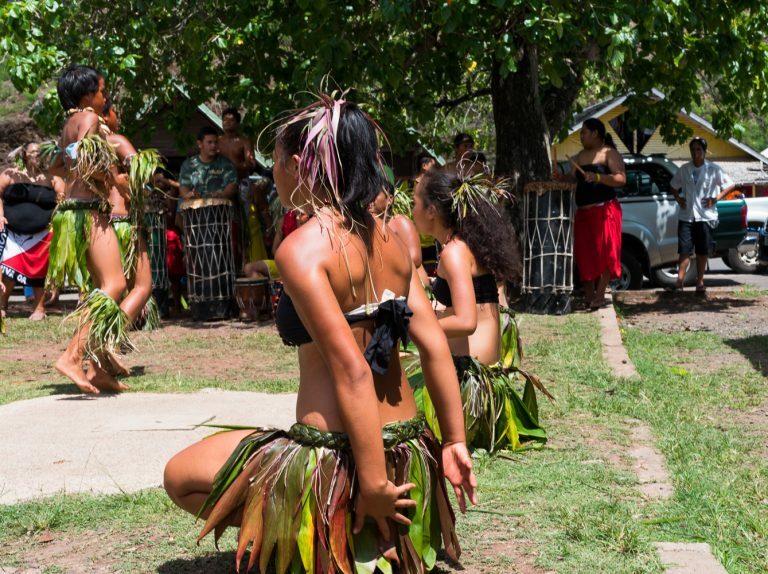 Fletcher and his men eventually settled down with Polynesian wives and their descendants live on Pitcairn to this day. 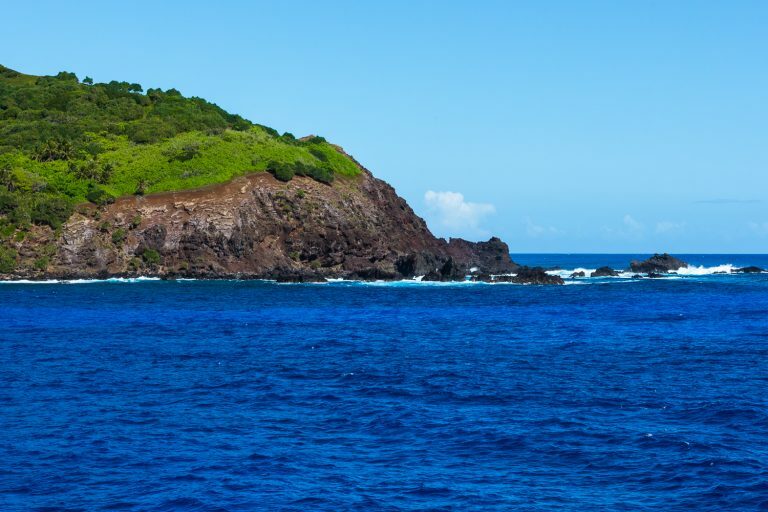 Pitcairn Island where some Bounty mutineers made their home. That’s where we have been visiting today. 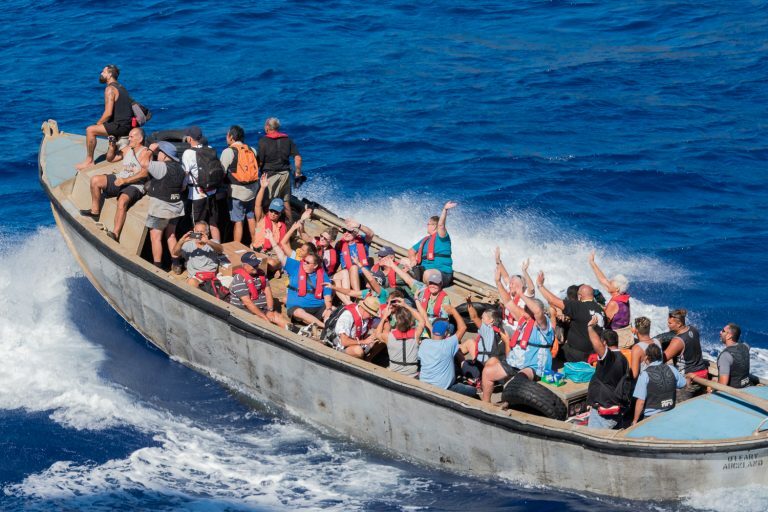 More precisely some of the native people came to visit us on the ship because it was too dangerous for us to board tenders to go ashore. Pitcairn is a beautiful island, but its population is, to put it mildly, very small. In fact, the total population of the island is about 55. Of the 55, about 10 are visitors. The island is part of the British Commonwealth. Britain has declared a 200-mile economic zone around it, and has placed the area under protection from environmental degradation. They are looking for people to emigrate to their island. If you emigrate to the island you get a plot of land, but building, or getting a house built, is your responsibility. The electricity stays on until 10:00 PM unless someone is watching a late movie on Netflix, in which case the power stays on till around 10:30. We decided to sail on and not emigrate anyway. 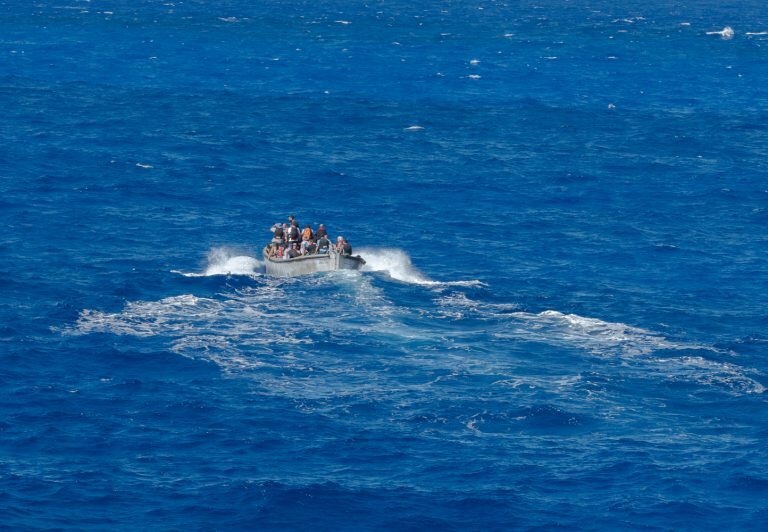 Anyway, here are a few shots of natives of Pitcairn making their way back to the island after visiting the ship. We are nearing an end to the segment of the cruise where we sail through French Polynesia. 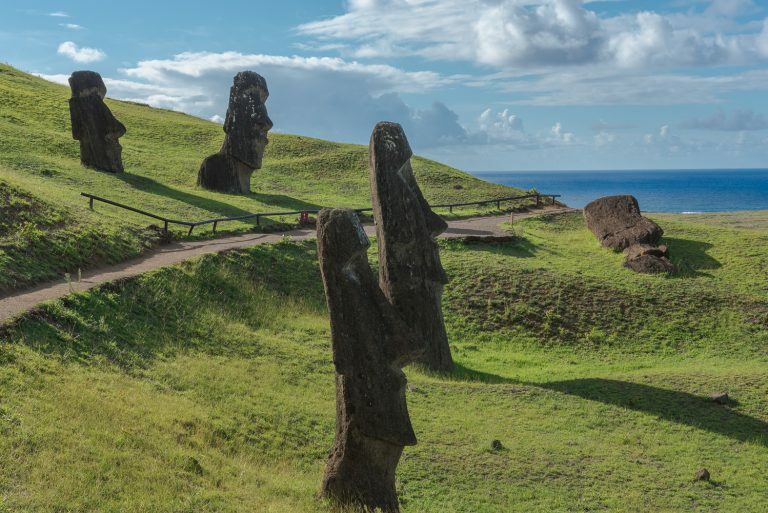 The last stop is Easter Island or Rapa Nui, which is actually claimed by Chile, some 2,200 miles away. 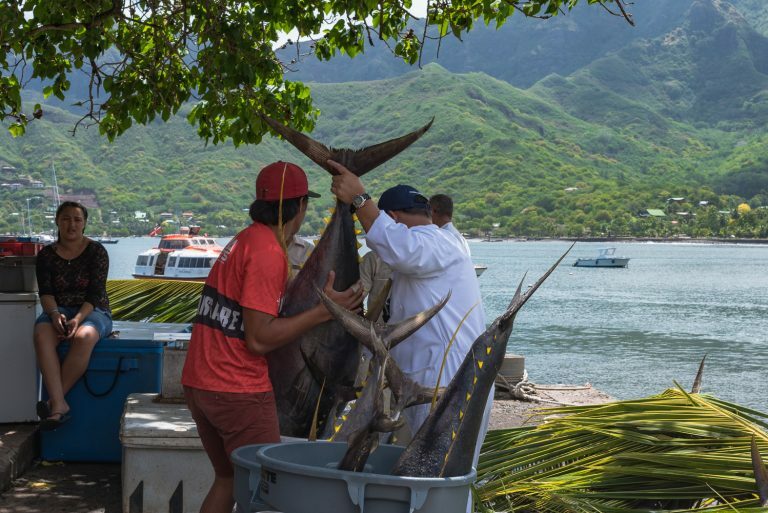 It is located in the southeastern Pacific Ocean, at the southeastern point of the Polynesian Triangle. 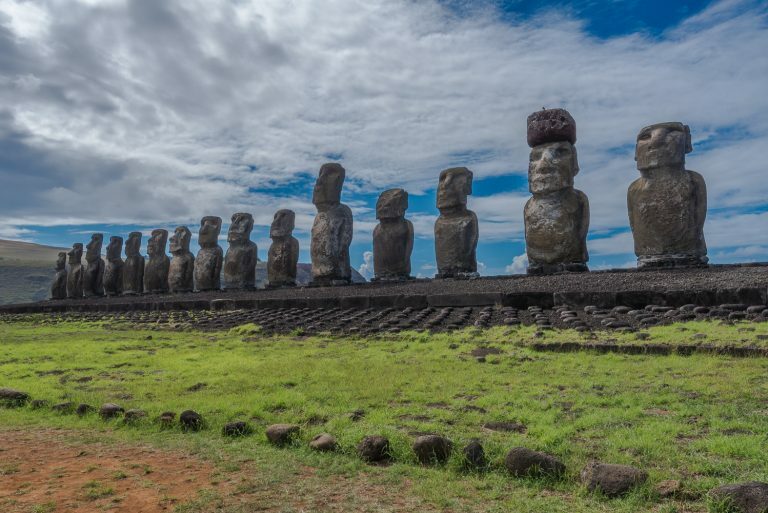 It is famous for its still extant Moai statues, thought to have been built by the Polynesian people several millennia ago. It is now a UNESCO World Heritage site. When we arrive there Friday, March 30, we will tour the island for 2 days with a small party of people from the cruise, led by a professor from Chile, who is widely regarded as being an expert on the island. So, we’ll report in on that trip, probably sometime the following week. 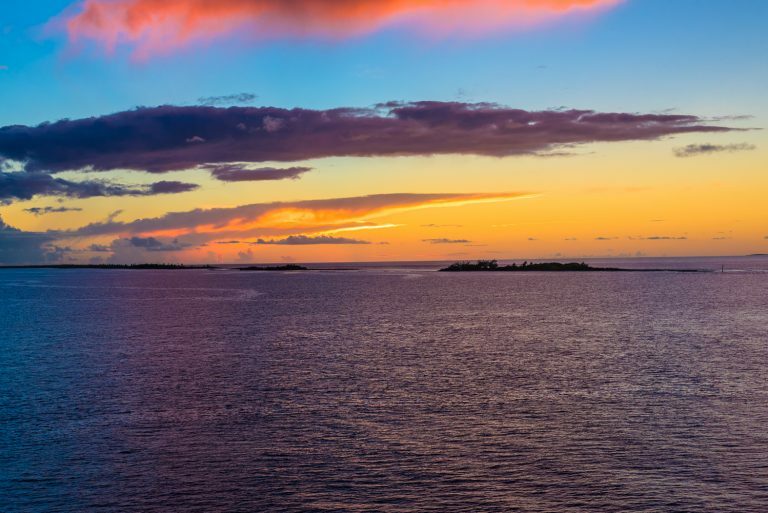 Meanwhile as we sail away from the South Pacific, we get to view beautiful sunsets and sail outs. Probably sunrises too, but we’ve been asleep for those. 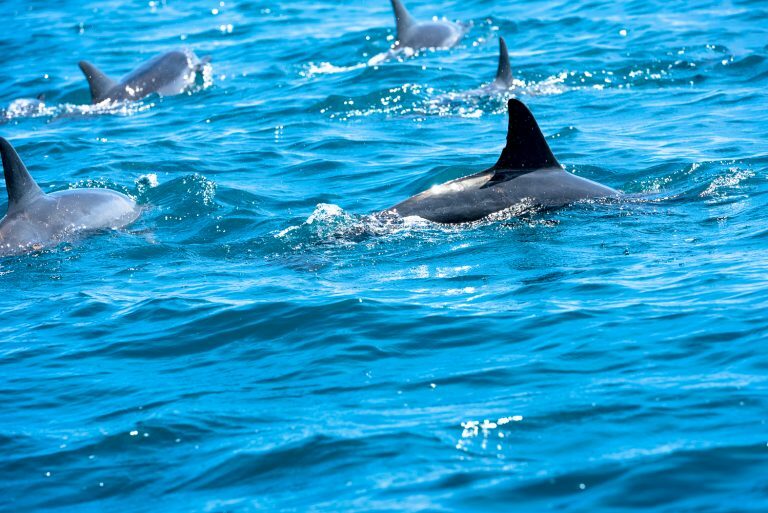 We also got a chance to go dolphin watching with a professor from Berkeley; watched fisherman bring their catch in on the island of Nuku Hiva, observe some native dancers and go on a tour of Nuku Hiva led by locals. Here are some photos, below. 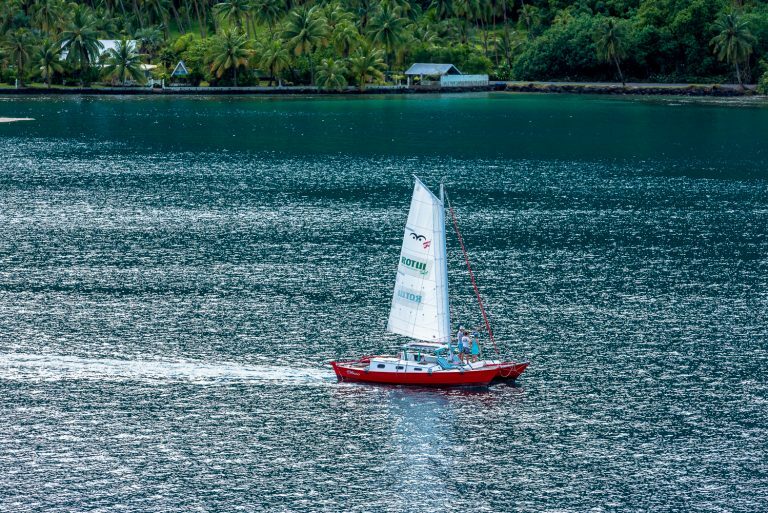 So here we are, sailing through the islands of French Polynesia, including Tonga, Moorea and Bora Bora. The settings are truly spectacular. The islands, mostly formed by volcanoes, rise out of the ocean often with large green mountains at the center. 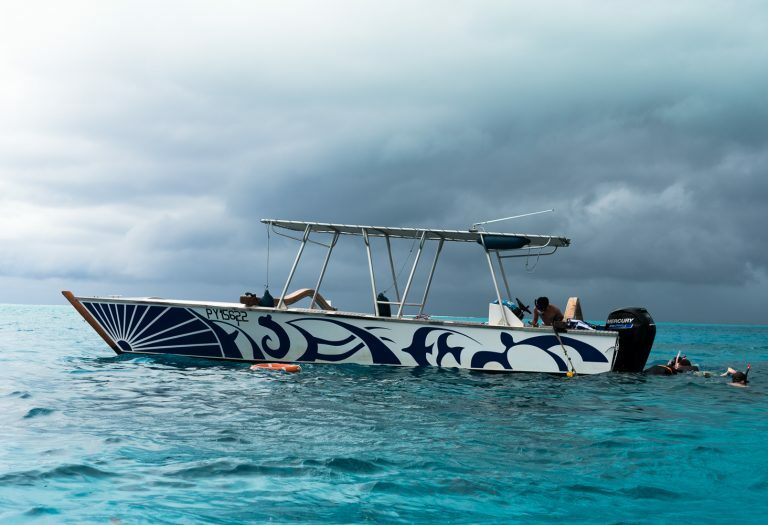 The waters surrounding the islands are very often surrounded by coral reefs where the water is a clear turquoise color. Because the water is so clean and clear, snorkeling is a major pastime. We did some ourselves and will probably do some more. In the meantime, here are a couple of shots from around the islands we have visited so far.